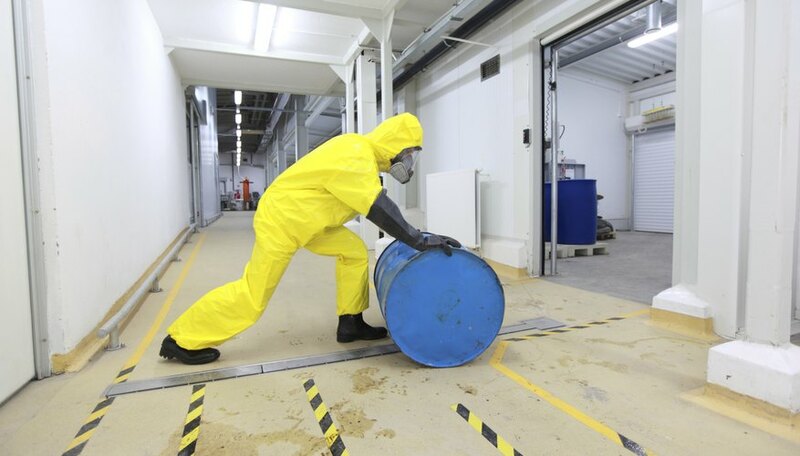 In the US, there are two main organizations behind the chemical warning symbols seen on hazardous substances: the Occupational Safety and Health Administration (OSHA) and the non-profit National Fire Protection Agency (NFPA). OSHA uses an array of symbols to convey the nature of a chemical hazard. The NFPA uses a multi-colored diamond design to achieve a similar goal. From a flame to an exclamation point, OSHA's wordless pictograms are meant to convey the nature of the threat posed by a particular chemical. Each pictogram consists of a black symbol on a white background with a red diamond border. For example, the flame symbol means the chemical might be flammable, self-heating, self-reactive, an organic peroxide or it might ignite upon exposure to air. An exclamation mark means the chemical could be an irritant, skin sensitizer, toxic, a narcotic or hazardous to the ozone layer. The NFPA uses only one symbol -- a four-sided diamond evenly divided into four smaller, colored diamonds that each contain a number or symbol. The top red diamond typically contains a number from 0 to 4, which represents a scale for a chemical's flammability. The left blue diamond contains a similar scale for toxicity. The right yellow diamond contains a scale for reactivity. Finally, the bottom white diamond is a space left for "special hazard" indicators, like one denoting that the chemical is a strong oxidizer or water reactive. Smith, Brett. "Chemical Hazard Symbols and Their Meanings." Sciencing, https://sciencing.com/chemical-hazard-symbols-meanings-6571618.html. 24 April 2017.